Quick-UX provides for the rapid, simple and quantifiable assessment of a product’s User Experience (UX). In answering the question of Desirability, "Should I use it?" the sub-category of Layout is one of frequent discussion, especially in the latest wave of online products and how they handle content presentation and interaction. The relationships between and among various page elements, how they play off of one another, constructively guiding a process, or organizationally segmenting a concept, can influence how accepted by the user the product is, and how Desirable, how much they (the users) will actually want to use it. Today, we will look at an example of an Internet product with Clear Visual Hierarchy, representing a Layout value of +0.4. JohnMees.com provides a very good, simple example of a Clear Visual Hierarchy. The most important section within the page hierarchy is the middle section of the page clearly indicated through its prominent centralized placement, large font headers, elegantly large and simple iconography, and high-contrast text on non-complex backgrounds. This section is valuable in its efforts of branding and immediately conveying the purpose of the site and the content to expect within. 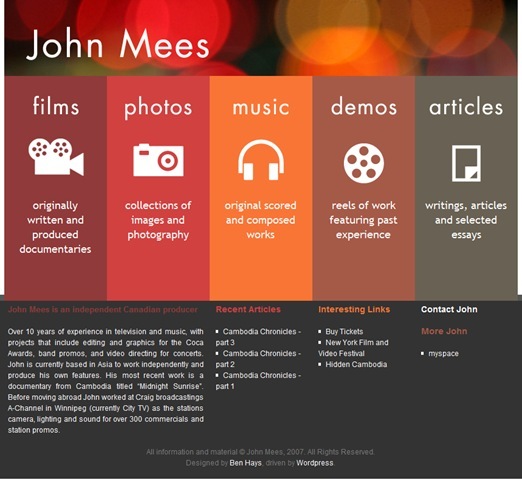 The obvious next level in the page hierarchy is the title region of the page, the individual’s name, John Mees. While having large, bold text, it is visually stressed to a lesser degree through the placement of a lower contrasting, patterned background behind the producer’s name. 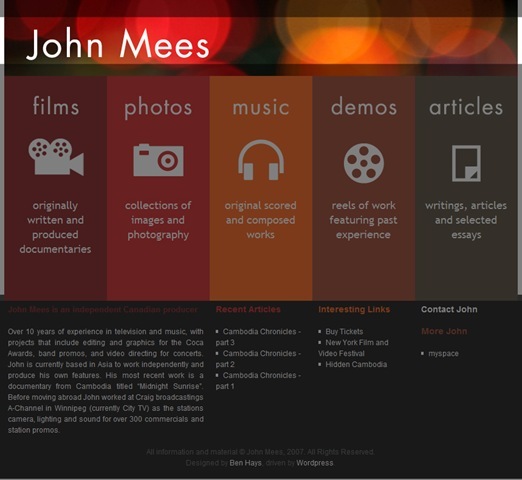 Finally, in the Visual Hierarchy of the page is the footer region, with decreased text and hierarchically organized from right, Contact John, to left, John’s details, from highest contrast section header to lowest contrasting. The Clear Visual Hierarchy of JohnMees.com is immediately obvious to everyone who visits, organized into basic layers, presenting a very pleasing and Desirable experience, both in graphic design, and in the coincident advancement of the marketing from most important to least important. Subscribe now (click here) to make sure you don’t miss any part of this series exploring the Desirability and Layout of Quick-UX, the quick and easy method of generating quantifiable and comparable metrics representing the understanding of the overall User Experience of a product, as well as other insightful posts from The Product Guy.